I love election day. Every three years, I collect my mum and head to Telopea Park School so we can engage in some banter with the how-to-vote-card spruikers, pick up a bargain snack at the cake stall or sausage sizzle, then exercise our democratic right, thereby potentially making a difference to the way our city, territory and country are run. I collect a how-to-vote card from every party, then lay them out in the cardboard cubicle inside to consider why they’ve placed their recommendations in the order they have, before I make a final decision on how to number my own papers. I always number every box despite being mocked for it by other family members who say there is no point because “it makes no difference” as those last few numbers will never feature in the count. It makes a difference to me. 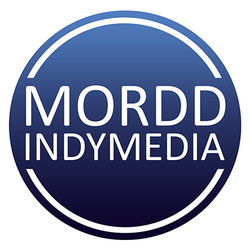 It’s important to me that I have that chance to place certain individuals or parties last, whether that statement has any impact on the final outcome or not. 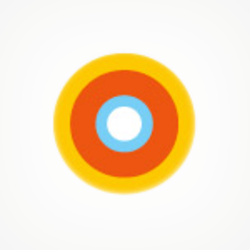 It gives me a sense of satisfaction that no other forum can provide. Anyway, enough about the politics and back to the snags and cupcakes. I’m wondering where you vote and why. Do you choose your booth based on proximity to home or work, because it’s easy to park there, or because it has the best food stalls? If the latter, can you let us know where these excellent sources of election day sustenance are? Perhaps you choose your site based on whether the money raised by food stalls is going to a worthy cause? Let us know. 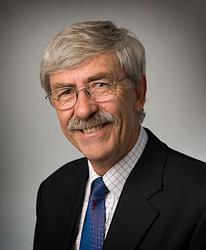 We’re going to head out on Saturday and trial some of your recommendations and come up with a Best of Canberra for polling booths, which will hopefully come in handy when we’re all back at it in October for the Legislative Assembly election. 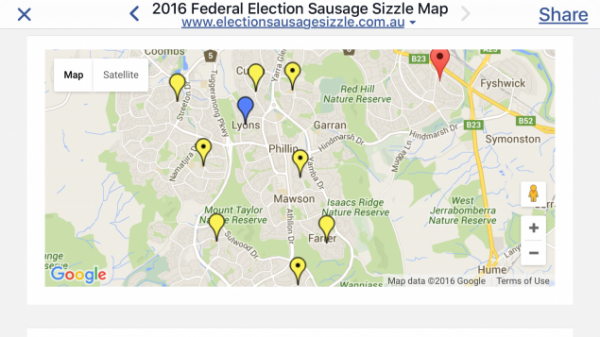 If you’ve forgotten where you voted last time, you can jog your memory and find out what’s on offer at each booth at the excellent and much-needed Election Sausage Sizzle website/app: www.electionsausagesizzle.com.au. 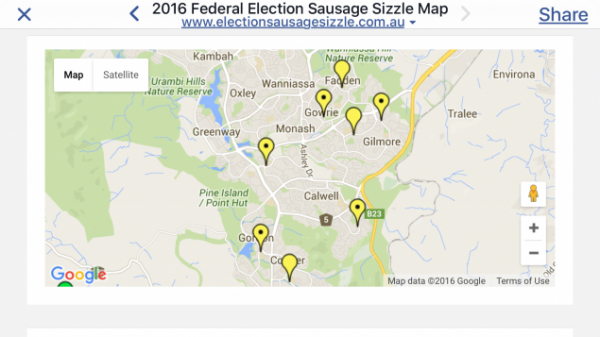 Find out what it’s all about here, and join the conversation on Twitter with @sausagesizzles or generally using #snagvotes and #democracysausage and ‘Like’ Snagvotes on Facebook. We’ve taken some screen grabs from the app and posted them here to show where the food will be in Canberra on Saturday (note these maps may be out of date already, for the most current list of stalls, see the site or app as stallholders may be adding their sites right up until we vote). We’d love you to post your photos of the stalls, booths, spruikers, candidates and snacks in your neighbourhood on our Facebook page or by tagging us on Instagram or Twitter. 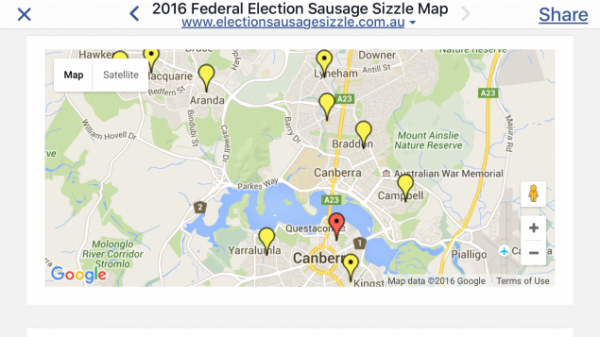 Use #actvotes, #actpol, #ausvotes, #auspol and most importantly, the aforementioned #snagvotes and #democracysausage. I have a confession to make: I’ll need some help from you all in judging the sausages. I’m a vegetarian, so always very impressed by the stalls that offer non-meat options on their polling booth barbecues, but I recognise I’m in a minority and the sausages are what it’s all about, really. So please let us know which sausages are tops. We voted last week at the Australian Embassy in Brussels. Unfortunately no sausage sizzle there. Lots of requests we were told but something to do with security and OH&S. A funny thing while we were there though, a Belgian with new Australian citizenship had to phone a friend in Australia to get advice on who to vote for. The friend lived in Bungendore! 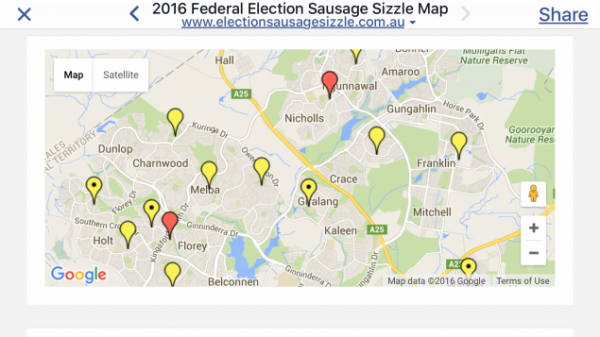 I read somewhere that the Australian polling place in the Netherlands had a sausage sizzle this year. Hopefully it was a success and will feature at other international destinations next election! That is correct, and I read it was extremely popular apparently. I’m on the stall at Wanniassa Hills Primary School for those who want to call in and say g’day. The snags there are great! The entertainment (provided by yours truly) is pretty good too! Haha, I may well come track you down on the way to work in the arvo then if you’ll still be around then, introduce myself properly and all that over snags! will the Liberals have Cevapi instead of sausage ? They’ve said on radio that OPH will not have a polling booth this election due to funding cutbacks. The OPH booth was only ever a ceremonial booth for those with a nostalgic connection to historic events (eg: “Kerr’s cur”). Nevertheless I’ve seen an old corflute on Hindmarsh Drive on the way to the Fyshwick gym advertising the polling booth at OPH. Could someone give a definitive answer as to whether there will in fact be a booth at OPH or else there might be some rather disappointed voters on Saturday. Unfortunately no sausage sizzle there. Lots of requests we were told but something to do with security and OH&S. A funny thing while we were there though, a Belgian with new Australian citizenship had to phone a friend in Australia to get advice on who to vote for. The friend lived in Bungendore! I’ll be at Curtin booth and very glad to see it is showing both sausage stall and cake stall! Vote Sausage for PM! I go to wherever is closest. It doesn’t matter to me whether any food or drinks are on offer as my goal is to get in and out as fast as I can. Based on your link my polling place does have them though. If I remember to take some cash (another reason I generally don’t care as I rarely carry cash on me) I’ll check them out. I’d forgotten OPH was used during the 2013 election. Looks like it’s going to be a busy day! NB: I vote at the old alma mater Melrose High. Over the years I’ve seen a few alumni and former teachers there voting so the old school tie is still strong. I’m sure mine is not the only Shiraz stained ballot paper that turns up! I like your strategy, deter voters from going to Old Parliment House will articles about the crowds, thus shorter lines for us that do. Telopea Park is my closest polling place, but I am planning on going to Old Parliament House this weekend. Although, I fear it may take a while as I’m sure I won’t be the only one going for the novelty of it all.